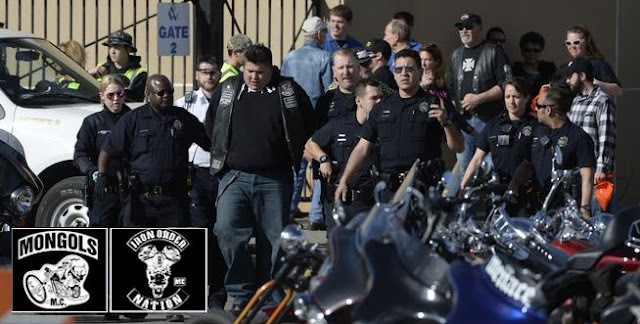 Biker Trash Network • Outlaw Biker News : Mongols MC "Iron Order started it"
The version Whitfield tells is much different. He said only about 15 members of the Iron Order were attending the event when three of them got separated from the group and were jumped by members of the Mongols, and possibly others, he said. "Once that happened, there was an opportunity to jump them, and they were sorely outnumbered," Whitfield said. Whitfield, who is flying to Denver Sunday to help handle the matter, said the fight started on a flight of stairs. "There were Mongols in front, and Mongols in back," and they began harassing an African American member of the Iron Order. "One of the Mongols knocked a beer out of his hand and called him a racial slur," Whitfield said. Another member of the Mongols then confronted the corrections officer, and another Iron Order member, who was later taken into custody. The Mongols shot first, he said. "It grazed one of our guys, and then hit another one. Then they stabbed one of our guys repeatedly and started beating up the other fellow." Bohm, a former "patched" member of the Mongols, said he arrived at the show just after the shooting as a large group of Banditos were streaming out of the Expo. The primary combatants were members of the cop club and the Mongols, but it was an off-duty cop who fatally shot the Mongol, he said. He said he is concerned that any investigation will not result in charges against a police officer, even though shooting a gun at a crowded show with kids is very dangerous. "If a cop shoots him they'll find some way to get him off," Bohm said Sunday. Detectives continue to interview witnesses Sunday, Raquel Lopez, Denver police spokeswoman said. "As of right now there are no arrests," Lopez said. "They are still trying to figure it out." Lopez said she does not know which club the person who died Saturday is affiliated with. And that isn't a detail that Chief Robert White is going to release at this point, she said. Detectives have not been able to question some of the key witnesses, including those who were shot or stabbed, because they are still undergoing treatment. "There is a lot of information that is still not known," Lopez said. Lopez said she cannot comment on whether guns used in an exchange of gunfire have been obtained. That information is part of the investigation and will not be revealed, she said. Denver police spokesman Sonny Jackson said that the melee will be thoroughly investigated and when the review is complete, the case will be presented to District Attorney Mitch Morrissey for possible charges. "We're hearing different things about what happened," Jackson said. Before the police department releases facts about what happened they will conduct a thorough investigation including collecting evidence at the scene. The Denver Coroner's Office will release the identity of the dead man, she said. Stubbs declined to name the dead man. The injured were taken to Denver Health Medical Center, and the hospital put on lockdown for a few hours Saturday afternoon. The lockdown has since been lifted, and the hospital is in normal operations, though officers are still on the scene to prevent further trouble. The seven people injured Saturday remained hospitalized Sunday. Three are listed in critical condition and four are listed in stable condition. Denver officials canceled the expo's Sunday session at the National Western Stock Show Complex. On Sunday, the expo's organizer posted a short message apologizing to vendors and patrons for the inconvenience. Robert Lee comes to the event every year from his home in England to buy and sell motorcycles. On Sunday, he was loading a pair of motorcycles he had sold into a trailer. The shooting broke out near the spot where he was selling, but he had left his booth to get a bowl of chile, and didn't witness the bloodshed. When he returned to the booth, police had cordoned it off, and he was unable to sell anything else. The violence, "just killed business stone dead," he said. "We do get gang fights in England, but they try not to do it in public. It is just wrong to bring guns to an event like this," he said. Donald Haverland, who was showing motorcycles at the Expo with his wife, has come to the event for each of the past seven years. During that time, there have been altercations between packs of bikers, but nothing as serious as Saturday's deadly brawl. "But I have noticed a level of antagonism increasing over the years," he said. 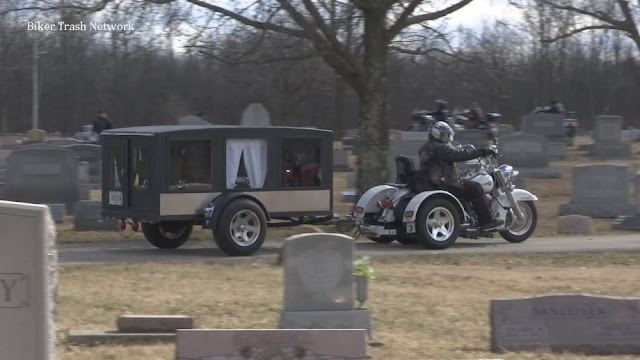 When the couple first began coming to the show, Haverland said, he often saw several members of different motorcycle clubs talking to each other. Most of the bikers considered the event neutral territory. But over the past two or three years, he noticed a change in attitude. "Someone would walk up to somebody real fast like they were mad, and then stop about 10 feet away and stare at them, and there were groups bumping into others, he said. "I haven't wanted to come for the past five or six years because I could see an escalation," Haverland said. He came this year because his wife, Rochelle Hayes-Haverland, insisted. She said she heard about the brawl while she was attending the Tanner Gun Show, held at the Denver Mart, on East 58th Avenue. "I was shocked," she said.